Expedition 56 Flight Engineers Alexander Gerst of ESA (European Space Agency) and Serena Auñón-Chancellor of NASA commanded the International Space Station’s Canadarm2 robotic arm to release the Cygnus cargo spacecraft at 8:37 a.m. EDT. At the time of release, the station was flying 253 miles above the Southeastern border of Colombia. 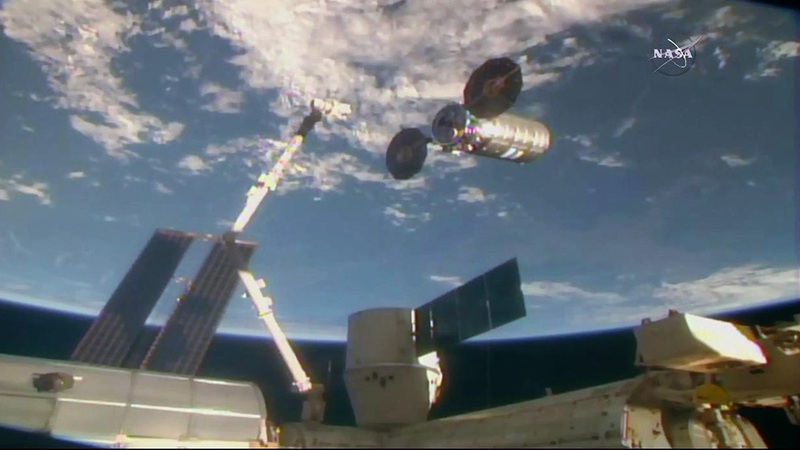 Earlier, ground controllers used the robotic arm to unberth Cygnus. The departing spacecraft will move a safe distance away from the space station before deploying a series of CubeSats. Cygnus will remain in orbit for two more weeks to allow a flight control team to conduct engineering tests. Cynus is scheduled to deorbit with thousands of pounds of trash on Monday, July 30, as it burns up harmlessly over the Pacific Ocean while entering the Earth’s atmosphere. The satellite deployment and deorbit burn will not be broadcast on NASA Television. NASA astronaut Ricky Arnold is inside the seven-windowed Cupola that provides views of the Earth below as well as approaching and departing resupply ships. The Expedition 56 crew members explored a variety of microgravity science today potentially improving the lives of people on Earth and astronauts in space. The orbital residents are also unpacking a new resupply ship and getting ready for the departure of another. Cancer research is taking place aboard the International Space Station possibly leading to safer, more effective therapies. Flight Engineer Serena Auñón-Chancellor contributed to that research today by examining endothelial cells through a microscope for the AngieX Cancer Therapy study. AngieX is seeking a better model in space to test a treatment that targets tumor cells and blood vessels. She also teamed up with Commander Drew Feustel imaging biological samples in a microscope for the Micro-11 fertility study. The experiment is researching whether successful reproduction is possible off the Earth. The Northrop Grumman Cygnus space freighter has been packed full of trash and is due to leave the space station Sunday morning. Flight Engineer Alexander Gerst will command the Canadarm2 robotic arm to release Cygnus at 8:35 a.m. EDT as Auñón-Chancellor backs him up. It will orbit Earth until July 30 for engineering studies before burning up harmlessly over the Pacific Ocean. Cosmonauts Oleg Artemyev and Sergey Prokopyev were back at work unpacking cargo delivered Monday aboard the new Progress 70 cargo craft. The 70P will stay at the station’s Pirs docking compartment until January. Expedition 56-57 crewmates (from left) Serena Auñón-Chancellor of NASA; Alexander Gerst of ESA (European Space Agency); and Sergey Prokopyev of Roscosmos. Expedition 56 crew members are transferring cargo in and out of U.S. and Russian cargo ships today. Two astronauts are also planning to release a U.S. resupply ship on Sunday ending its mission at the International Space Station. 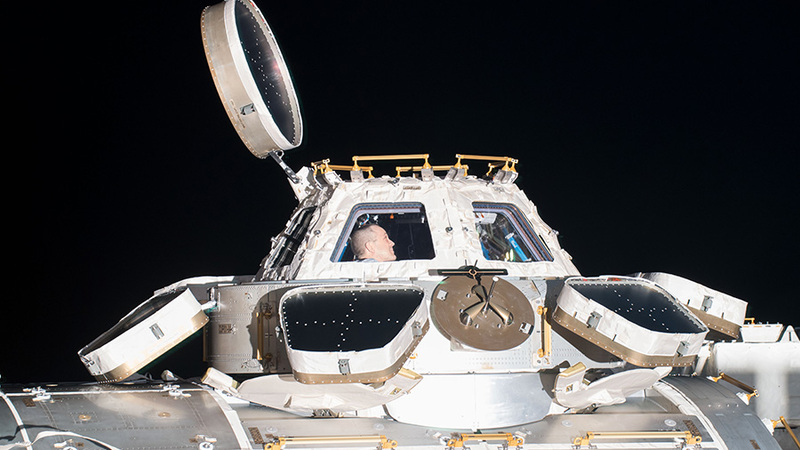 Astronauts Serena Auñón-Chancellor and Alexander Gerst were back inside the SpaceX Dragon today unloading science gear and station hardware from inside the space freighter. Cosmonauts Oleg Artemyev and Sergey Prokopyev of Roscosmos continued unloading the nearly three tons of crew supplies and station hardware delivered Monday aboard the new Progress 70 cargo craft. The Cygnus resupply ship will complete its stay at the orbital Sunday at 8:35 a.m. EDT after 52 days attached to the Unity module. Gerst of ESA (European Space Agency) will use the Canadarm2 robotic arm to release Cygnus back into Earth orbit backed up by Auñón-Chancellor of NASA. Cygnus will remain in orbit until July 30 supporting engineering activities before it is deorbited to burn up harmlessly over the Pacific Ocean. Space research aboard the orbital lab is always ongoing as the crew explored a variety of life science today. 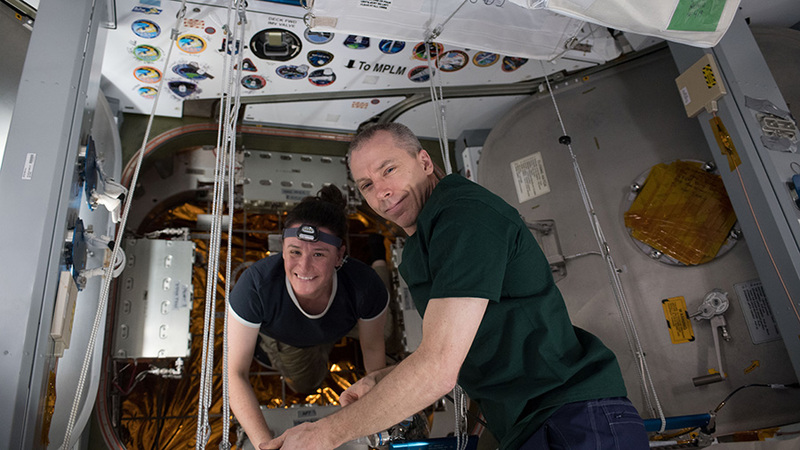 The space residents explored how microgravity impacts fertility, algae production and the gastrointestinal system. The crew also completed routine eye checks with an ultrasound device Wednesday morning to maintain good vision during spaceflight. 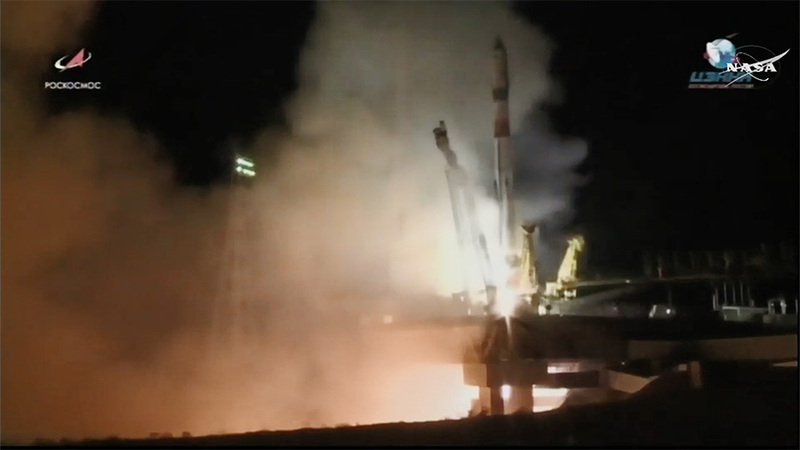 The Russian Progress 70 cargo craft lifts off on time from the Baikonur Cosmodrome in Kazakhstan on a short trip to deliver supplies to the space station. At the time of launch, the International Space Station was flying about 250 miles over southwest Uzbekistan, south of the Baikonur Cosmodrome. Less than 10 minutes after launch, the resupply ship reached preliminary orbit and deployed its solar arrays and navigational antennas as planned. The Russian cargo craft will make two orbits of Earth before docking to the orbiting laboratory. NASA TV coverage of rendezvous and docking will resume on the NASA’s website at 9 p.m.
To join the conversation about the space station and Progress 70 online, follow @space_station on Twitter. 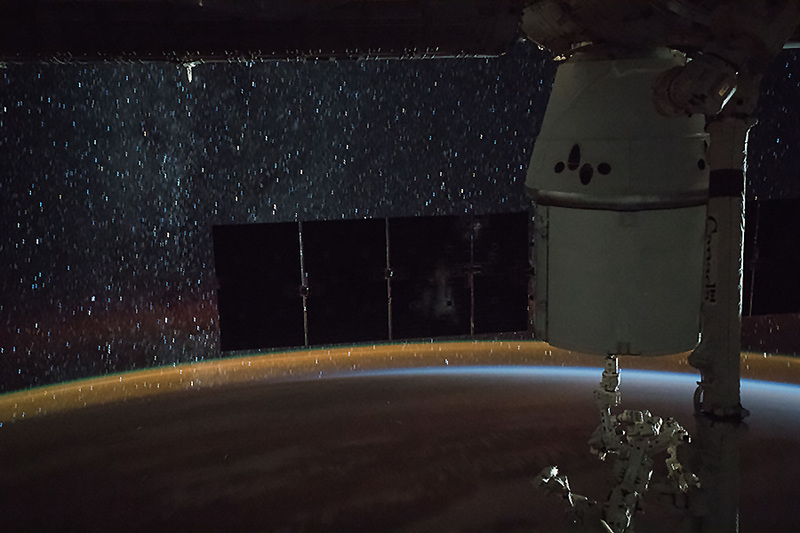 A star-lit sky and Earth’s atmospheric glow are the backdrop as the Canadarm2 robotic arm with its Dextre robotic hand attached is poised to begin extracting cargo from the SpaceX Dragon’s trunk. Overnight, mission controllers commanded the Canadarm2 robotic arm to extract a new Earth-observing experiment from the rear of the Dragon space freighter. The new ECOSTRESS gear was then remotely installed on the outside of the Kibo laboratory module. ECOSTRESS will provide thermal infrared measurements of Earth’s surface helping scientists assess water and vegetation changes on agriculture. The Progress 70 resupply ship from Roscosmos is being processed for launch Monday at 5:51 p.m. EDT from the Baikonur Cosmodrome in Kazakhstan. Russian mission controllers are planning a short 3 hour and 48 minute delivery trip, or just two orbits, to the station’s Pirs docking compartment. NASA TV will broadcast the launch and automated docking live beginning Monday at 5:30 p.m. and again at 9 p.m. 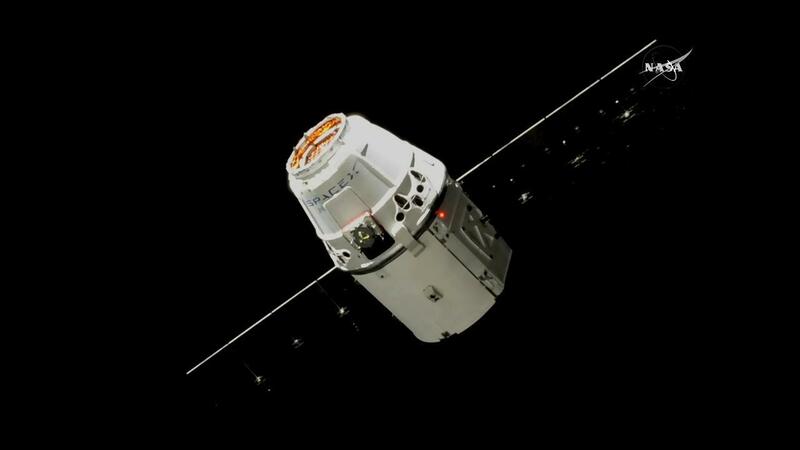 The SpaceX Dragon cargo craft is pictured moments after being captured with the Canadarm2 (the 57.7-foot-long robotic arm designed and built by the Canadian Space Agency) controlled by NASA astronaut Ricky Arnold as the International Space Station orbited over Quebec, Canada. 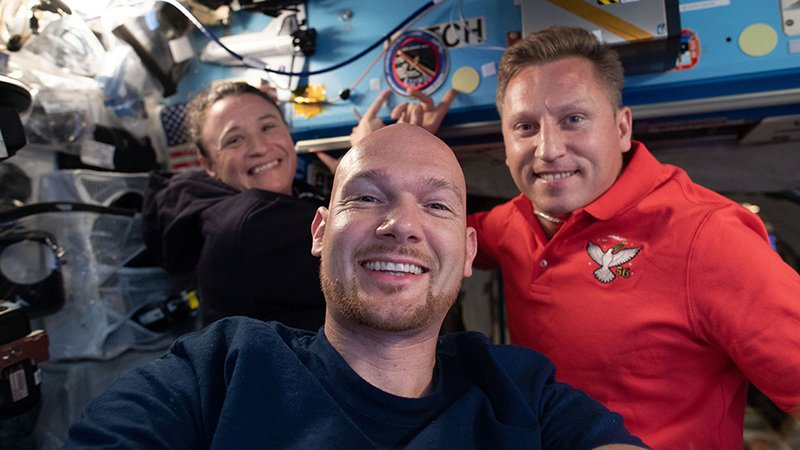 The International Space Station crew from the United States, Russia and Germany is going into the Fourth of July holiday unpacking new research gear from the SpaceX Dragon cargo craft. The six Expedition 56 crew members also conducted advanced space research and orbital lab maintenance today. July 2, 2018: International Space Station Configuration. 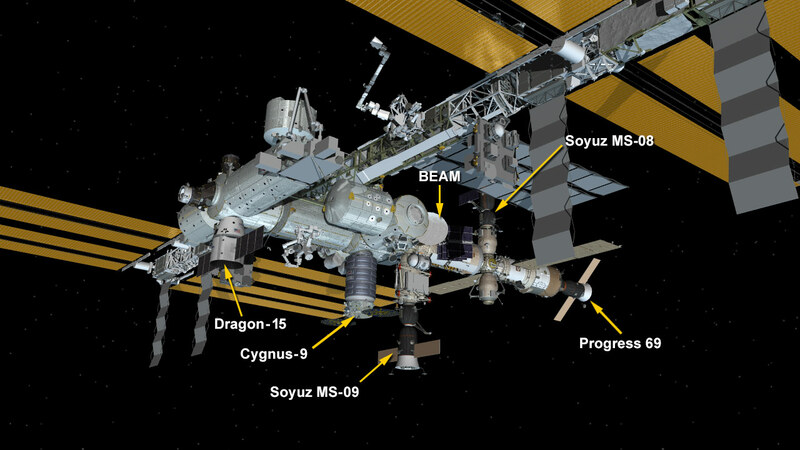 Five spaceships are attached to the space station including the SpaceX Dragon and Cygnus resupply ships from the United States; and from Roscosmos, the Progress 69 resupply ship and the Soyuz MS-08 and MS-09 crew ships. 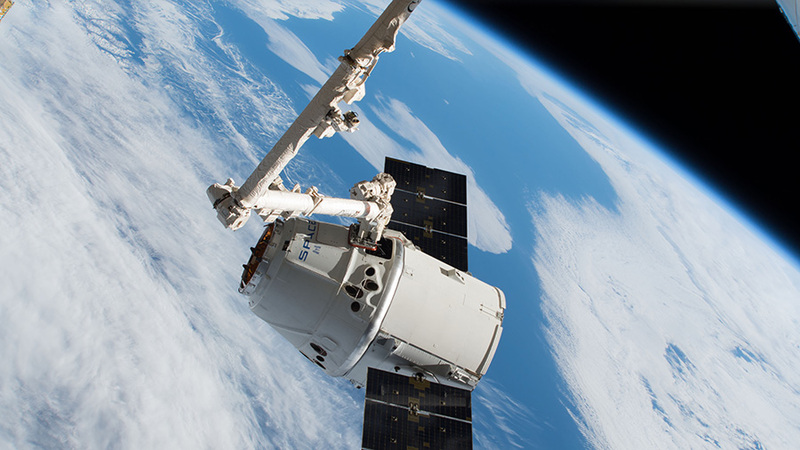 Three days after its launch from Florida, the SpaceX Dragon cargo spacecraft was installed on the Earth-facing side of the International Space Station’s Harmony module at 9:52 a.m. EDT.